Nothing makes or breaks a backpacking trip like your backpack does. A good pack will allow for days of comfortable trekking, while an uncomfortable, burdensome pack will make your trip seem like a death march. When we think of long backpacking trips, we think of large bags capable of carrying excesses of 50 pounds. The High Sierra Sentinel 65 Internal Frame Backpack definitely lands in this category. The 65 liters of storage should provide ample room for all your backpacking provisions, and given its simple, ergonomic design, it’s also a favorite for backpacking travel abroad. The Sentinel 65 doesn’t have any groundbreaking features, but many would complement it on being free of unnecessary gimmicks. There are better made packs on the market, but one would be hard pressed to find a higher quality large pack at the same price point. Overall, the Sentinel 65 isn’t a revolution to the backpacking industry, but it’s a quality product that will serve well for hosteling and moderately aggressive backpacking excursions. 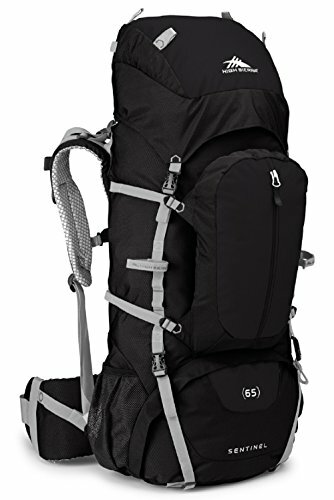 The Sentinel 65, like other High Sierra packs, is packed from the top. While other High Sierra devices are limited in this regard—since it’s the only main pocket, it requires serious effort to reach the first item packed—the Sentinel 65 mostly alleviates this concern by adding in several additional access points to the pack, giving easier access to its contents on the trail. It’s a comfortable wear thanks to its internal frame, the pack’s most modern feature. The frame can be adjusted easily based on height or torso length, and its dual-contour aluminum frame make it relatively light, given its hefty carrying capacity. It has a floatable lid that can be extended up and down to allow for extra top packing. Its main chamber is divided between an upper and lower compartment, with the latter accessible through the bottom pocket. The pack also has a floating, removable front pocket that allows for quick access on the trail. The hip belt and lower lumbar pad are both large and wide, a good indication of comfort and support. Acknowledging this pack’s popularity among travelers, High Sierra added a handy feature to make flying with it much easier. It comes with a tucked away rain cover that can completely encapsulate the bag, which adds a level of security in the airport and prevents its many loops and straps from getting caught up in the airport’s baggage machinery. The rain cover also includes an ID tag to meet airport requirements. And to state the obvious: This bag is far too large to use as a carry-on item. One of the strongest qualities of the pack is its easy access to water. In addition to two side pockets for water bottles typical of similar packs, it includes an internal hydration reservoir sleeve with exit ports near both shoulders, allowing you to put the reservoir tube on your preferred side. It’s also worth noting that High Sierra makes their own hydration packs, although any standard bladder will fit. BONL makes excellent military-grade reservoirs insulated to keep water at a good temperature. This is a long-haul pack, good for treks anywhere from a couple days to weeks-long traveling. If you backpack exclusively on the weekends, this pack might be overkill. High Sierra makes 45-liter packs that might be a better fit. No need to carry excess frame weight. Though when you consider that the Sentinel 65 only weighs two pounds, it won’t be the end of the world if this pack is slightly too large for your needs. 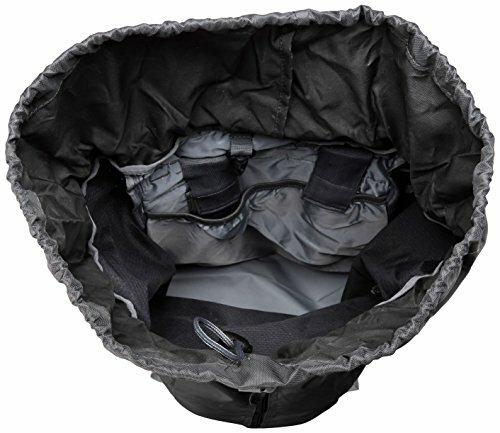 For those just entering the world of backpacking, internal frames are often preferred because they take the frame directly of the carrier’s body, which increases comfort. The Sentinel 65 goes several steps beyond this, by using an “ergo-fit shoulder harness” and mesh, padded straps to add extra comfort. It also uses “air-flow” technology to create some breathability where your back rests against the pack, reducing scourge of many a backpacker: back sweat. All this is hard to appreciate in writing. And in general, while researching features like this is critical in purchasing a pack, you shouldn’t get out your wallet until you’ve tried one on. Pack comfort is very subjective and dependent on the wearer. Because of the Sentinel 65’s adjustability to a range of body sizes, it’s going to be comfortable to a wider range of people than other packs. Still, you should value your own standard of comfort over that of any review you read. An easy way to do this is to research bags you’re interested in, head to REI or another outdoor store and find the pack there. They’ll usually have weight to put in the bag so you can simulate a fully packed bag. To know how large of a pack you’ll need, gather all your typical backpacking gear, weigh it, then go off that. 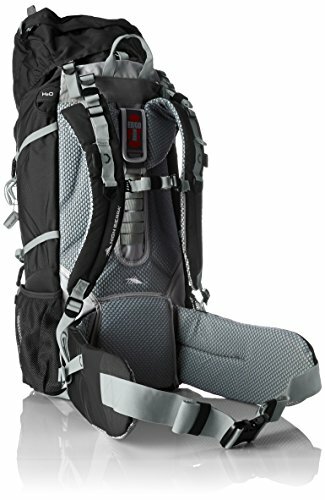 For roughly $100 (as of this writing), this is an affordable, mid-range pack, good for those just getting into backpacking, or other enthusiasts who know they won’t need a ton of wear-and-tear. You can check this listing for the very latest pricing. “High Sierra bags are warranted to the original owner against defects in materials or workmanship under normal recreational use. If a warranted product fails due to a material or manufacturing defect, we will repair or replace the product at our option. This warranty does not include products with wheels, which have a 5-year warranty. In other words, you’re out of luck when the bag wears out, but they’ll replace it if something goes wrong, so long as you didn’t buy it used. A Deleware-based subsidiary of Samsonite, LLC founded in 1978, High Sierra specializes in outdoor, durable luggage. If it does an especially large amount of philanthropic work or makes great effort toward progressive business practices, it makes no note of it on its website. “High Sierra … works to ensure that its supply chain reflects its values as a company. High Sierra expects its suppliers to treat their workers fairly, to provide them with a safe and healthy work environment and to protect environmental quality. The Sentinel 65 is a large, sturdy pack well-suited for most backpacking excursions. Its practical, no-frills design make it light weight and low-maintenance. It’s not a pack to get especially excited about, but it’s reliable. At the end of the day, the latter is the quality to look for in a pack. More importantly, at an affordable price, the Sentinel 65 is a good investment for those just wading into the waters of backpacking, since it provides a solid, heavy duty pack without a large financial commitment.